Wycombe went second in League Two by beating Exeter to end the Grecians' unbeaten home record this season. Exeter bossed the first half and came close when Joel Grant fired over from 12 yards before having a penalty claim rejected when Jordan Moore-Taylor felt he had been pulled in the box. But the visitors took the lead when left-back Joe Jacobson curled in a fine free-kick from 20 yards. 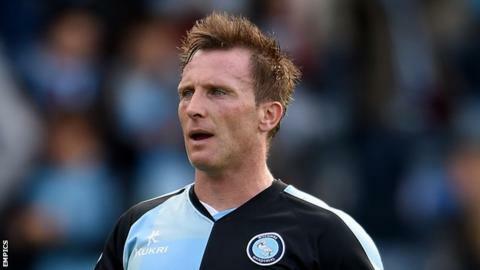 Garry Thompson's 57th-minute drilled effort sealed Wycombe's victory. "First half we weren't good enough - we were not at the races and we were lucky to go in 0-0 at half time. I wanted a reaction and I got a reaction. "The boys really grasped what we wanted to do in the second half to see the game out. "To come here and take all three points away from Devon is great and the lads deserved it for that second half." Match ends, Exeter City 0, Wycombe Wanderers 2. Second Half ends, Exeter City 0, Wycombe Wanderers 2. Max Kretzschmar (Wycombe Wanderers) wins a free kick in the attacking half. Attempt blocked. David Wheeler (Exeter City) right footed shot from outside the box is blocked. Substitution, Wycombe Wanderers. Daniel Rowe replaces Ryan Sellers because of an injury. Delay in match Ryan Sellers (Wycombe Wanderers) because of an injury. Substitution, Wycombe Wanderers. Ryan Sellers replaces Luke O'Nien. Corner, Exeter City. Conceded by Matt Ingram. Attempt saved. Tom Nichols (Exeter City) right footed shot from outside the box is saved in the top right corner. Attempt blocked. Lee Holmes (Exeter City) left footed shot from outside the box is blocked. Attempt blocked. Tom Nichols (Exeter City) left footed shot from outside the box is blocked. Attempt blocked. Tom Nichols (Exeter City) right footed shot from outside the box is blocked. Christian Ribeiro (Exeter City) wins a free kick in the attacking half. Jordan Moore-Taylor (Exeter City) wins a free kick in the defensive half. Corner, Exeter City. Conceded by Aaron Pierre. Clinton Morrison (Exeter City) wins a free kick in the defensive half. Corner, Exeter City. Conceded by Michael Harriman. Substitution, Wycombe Wanderers. Max Kretzschmar replaces Matt Bloomfield. Corner, Exeter City. Conceded by Marcus Bean. Attempt blocked. Lee Holmes (Exeter City) right footed shot from outside the box is blocked. Attempt missed. Jordan Moore-Taylor (Exeter City) header from the left side of the six yard box misses to the left following a corner. Attempt blocked. Alex Nicholls (Exeter City) right footed shot from the right side of the box is blocked. Substitution, Exeter City. Tom Nichols replaces Will Hoskins. Substitution, Exeter City. Alex Nicholls replaces Joel Grant. Foul by Joel Grant (Exeter City).